Do you want to achieve success in your personal and professional endeavours? The first step is to see a reality where success is possible. Only when we choose to believe we live in a world in which challenges can be overcome, in which our behaviour matters, and in which change is possible can we summon all our drive, energy and emotional and intellectual resources to make that change possible. What made the experience of listening to Before Happiness the most enjoyable? 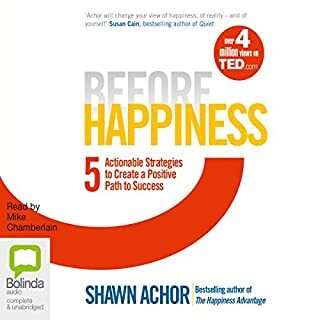 After watching Shawn's Ted talk and listening to the Happiness Advantage it was disappointing to hear this new narrator. The book has some really good ideas but I am absolutely struggling to listen or to keep focussed on listening because of the narrator. The tone seems a little too exaggerated and is just not fitting. I realy wish Shawn would re-read this. I am considering returning this and getting the kindle version instead. Would you be willing to try another one of Mike Chamberlain’s performances? It would be unlikely that I try another of Mike's performances but maybe some people would enjoy it, or maybe he would suit a different genre.